Scores of protesters rallied in Martinez on Wednesday to denounce the Contra Costa County sheriff’s department for helping Immigration Customs Enforcement deport undocumented immigrants, some of whom came to the United States when they were small children. The demonstrators, who gathered at the McBrien Administrative Building on Pine Street at 10 a.m., hail from a variety of different social justice groups, including Black Women Organized for Political Action and the Safe Return Project, among others. They rallied for about an hour and then marched toward the county’s courthouse. 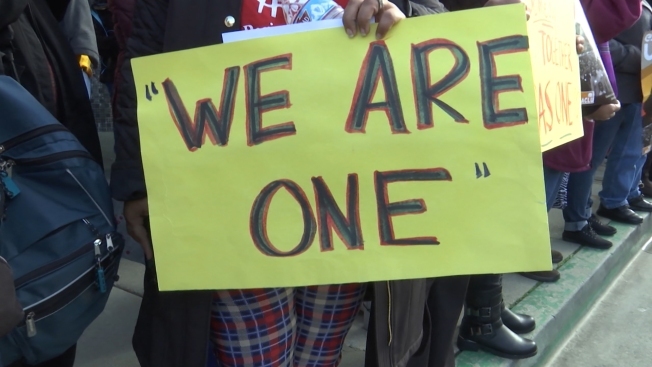 The rally was prompted by an East Bay Express investigation that details the sheriff’s close collaboration with Immigration Customs Enforcement. According to the Express report, sheriff’s officials in the county often went to extreme lengths to lure undocumented immigrants to the building, where ICE officials then “ambushed” them. Immigration attorney Ali Saidi told protesters that Contra Costa County should protect its immigrant community, not help deport them, despite the looming threat of pulled funding and a crackdown from the Trump administration. As he was speaking, two passersby shouted, “Build the wall!” and “Blue lives matter!,” though Saidi carried on undeterred. Other speakers included Richmond City Councilmember Melvin Willis and former Martinez City Councilmember and current gubernatorial appointee AnaMarie Avila Farias, who spoke to the diverse crowd in Spanish. Both leaders urged sheriff’s officials to stop collaborating on deportations. Sheriff David Livingston came out and observed the protest at one point and told those who gathered that he intends to “follow the law.” He later told reporters that he and other sheriffs from around the state will be meeting with Gov. Jerry Brown on Monday to continue the discussion on policies affecting undocumented immigrants. When asked if it was a choice to notify ICE about undocumented immigrants or if it was a department requirement, Livingston noted that it was a “request that ICE makes” that his department then follows. The East Bay Express investigation, published earlier this month, sparked immediate outrage within the immigrant community. Chris Kim, a Hayward resident who immigrated to the U.S. when he was four, spoke to the East Bay Express about his experience. Kim, who had previously been arrested for possessing stolen property but was pardoned, showed up to what he thought was a routine meeting as part of a Sheriff’s Custody Alternative Program when he was surprised by ICE agents ready to take him away, the report states. "Many of us have been here all our lives," Kim told the Express. "It wouldn't be wise to send us back. We would have no support."